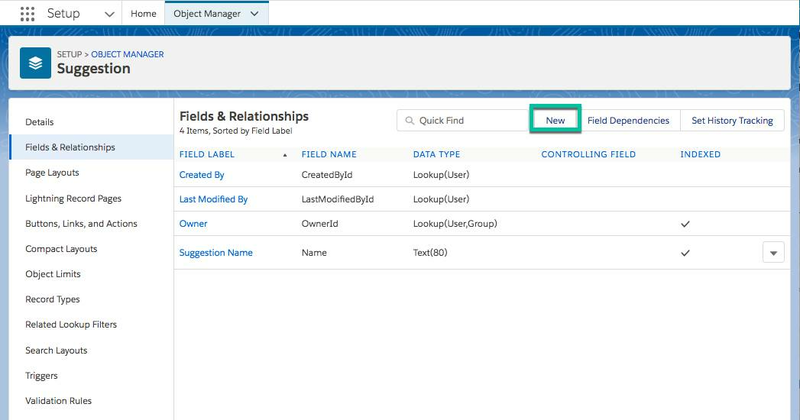 Create custom fields with the Custom Field Wizard and the Schema Builder. Try the app in the browser and in the Salesforce mobile app. By default, your custom object has some standard fields on it. You need to add more fields to store relevant information about each suggestion. Fields can store many types of data. Feel free to explore these later as you extend your app. For now, let’s add a few that we know we need. Click the Fields & Relationships section from the left navigation. This field will be used by employees when they explain their suggestion. For Data Type, select Text Area (Long), and click Next. Help Text: Please enter as much detail around this suggestion so we clearly understand your idea. Click Save & New to add the Suggestion Description to the page layout, save the Suggestion Description field, and return to the first step of the wizard. This field will help us categorize each suggestion. It will also make it easier for us to report on what types of suggestions we get the most. For Data Type, select Picklist, and click Next. Check the radio button next to Enter values, with each value separated by a new line. Leave the Display values alphabetically, not in the order entered - Unchecked. Leave the Use first value as default value - Unchecked. Uncheck the Restrict picklist to the values defined in the value set box​. Leave the defaults for the remaining fields, and click Next. Click Save to add the Suggestion Category to the page layout and save the Suggestion Category field. Click the App Launcher and select the Suggestion Box app. Click the Suggestions tab, and click New. You should see that your two custom fields were added to the Suggestion page. Fill in a sample suggestion and click Save. Try adding a record in the Salesforce mobile app, too. Note that the Suggestion page layout is the same on the browser as it is in the mobile app. That's the power of "build once, deploy anywhere" metadata. 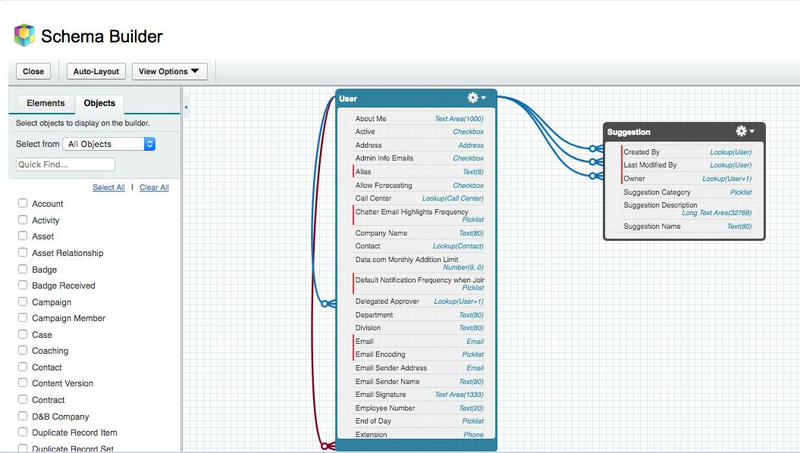 Schema Builder provides a dynamic environment to add new custom objects, custom fields, and relationships to your Salesforce database. It also eliminates the need to click from page to page to add a new custom field to an object or to find the details of a relationship. Let’s take a look at the Suggestion custom object in the Schema Builder. Click and select Setup. This launches Setup in a new tab. From Setup, enter Schema Builder in Quick Find, then select Schema Builder. From the Objects Palette (left-hand side), click Clear All and then select the Suggestion object and the User object. If you don’t see your objects in the Canvas area, click Auto-Layout and drag them around until you like how they are arranged. Let’s add more fields so that you can track the progress of a Suggestion. This field will help us track the status of the suggestion. It is also a way for the suggestor to know what is going on with their suggestion. This field will have unique security around it in that only Admins can change the status. Click the Elements tab in the left-hand side Palette. This displays all of the new things you can add to your database schema: objects and fields. Drag the Picklist field type and drop it on the Suggestions object. Check the Use first value as default value. Click Save to save the Status field. You should see the Status field at the top of the list of fields in the Suggestion object’s box in the schema diagram. Now, we'll update the Status field's security. While still in the Schema Builder, right-click the Status field that you just added to the Suggestion object. 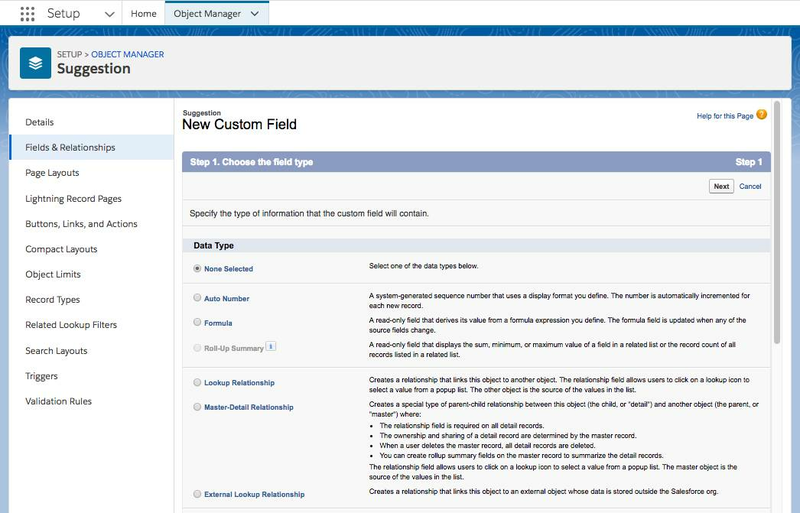 Click Manage Field Permissions. Click the Read-Only checkbox at the top of the column to make this field read only for all users. Uncheck the box in the Read-Only column next to System Administrator, then click Save. This field will help us track when the Suggestion was Implemented. It’s also important for us because we reference this field in the formula field created in a later exercise. This field will have unique security around it in that only Admins can change the date. Drag the Date field type and drop it on the Suggestions object. Click Save to save the Implemented Date field. You should see the Implemented Date field at the top of the list of fields in the Suggestion object’s box in the schema diagram. Now, we'll update the Implemented Date field's security. While still in the Schema Builder, right-click the Implemented Date field that you just added to the Suggestion object. Click Manage Field Permissions. Go back to the Suggestions tab in the browser, or to the Suggestions object in the Salesforce mobile app, and create a new Suggestion record. Notice anything? Where are our two new fields we just created, Status and Implemented Date? Don’t worry, they are there, just not on the page layout. When you use the Field Wizard, you have the option to add the field to the page layout automatically. When you use the Schema Builder, you need to add the field using the Page Layout Editor. In the next exercise, we’ll do that, and make some other modifications to the user experience, to make the app easier to use.